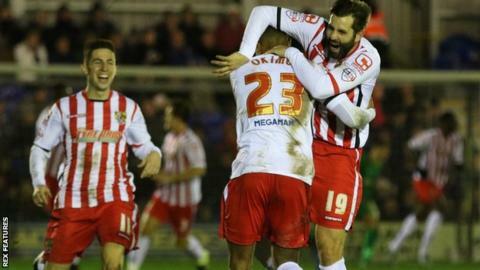 Jerome Okimo scored a free-kick from his own half as Stevenage came from behind to beat AFC Wimbledon. The Dons opened the scoring just before the break when Dannie Bulman's cross found George Francomb at the back post, and he headed past Chris Day. Jamile Matt latched onto Tom Pett's ball to equalise with a curling effort, having missed an earlier chance. And Okimo capped Stevenage's comeback as his free-kick bounced through the hands of goalkeeper Ben Wilson. "I'm standing here because the gaffer really feels let down and we won't be accepting those performances at this football club. "It was a tough game, the conditions played a big part, but they certainly played the conditions better than us. "We weren't physical enough, we didn't run hard enough, that's certainly not something this club is renowned for." "It's a little unfortunate on their behalf on how we got the second goal but we felt it was coming from the possession we had and pressure we put on them. "It was a very tough day to play football for both teams, one of the ugliest games I've seen in a long time. It was a day for hanging in there, battling, putting pressure on and keep on going. "It's funny how different you look at things after a couple results. We'll keep our feet on the ground. We've got another big game again next week and we're looking forward to it already." Match ends, AFC Wimbledon 1, Stevenage 2. Second Half ends, AFC Wimbledon 1, Stevenage 2. Attempt saved. Armand Gnanduillet (Stevenage) right footed shot from outside the box is saved in the top left corner. Corner, Stevenage. Conceded by George Francomb. Attempt blocked. Chris Whelpdale (Stevenage) right footed shot from outside the box is blocked. Corner, Stevenage. Conceded by Ben Wilson. Attempt saved. Lee Cox (Stevenage) right footed shot from the right side of the box is saved in the top left corner. Jerome Okimo (Stevenage) wins a free kick on the right wing. Attempt missed. Chris Whelpdale (Stevenage) header from the left side of the six yard box is too high. Corner, Stevenage. Conceded by Jake Reeves. Attempt saved. Armand Gnanduillet (Stevenage) right footed shot from the centre of the box is saved in the top left corner. Goal! AFC Wimbledon 1, Stevenage 2. Jerome Okimo (Stevenage) from a free kick with a left footed shot to the top right corner. Substitution, AFC Wimbledon. Tom Elliott replaces Adebayo Akinfenwa. Corner, AFC Wimbledon. Conceded by Tom Pett. Foul by Michael Tonge (Stevenage). Jamie McCombe (Stevenage) wins a free kick in the attacking half. Goal! AFC Wimbledon 1, Stevenage 1. Jamille Matt (Stevenage) right footed shot from the left side of the box to the top right corner. Assisted by Jerome Okimo. Attempt missed. Dean Wells (Stevenage) header from the centre of the box is too high. Corner, Stevenage. Conceded by Karleigh Osborne. Attempt blocked. Armand Gnanduillet (Stevenage) right footed shot from outside the box is blocked. Substitution, Stevenage. Armand Gnanduillet replaces Callum McFadzean. Hand ball by Callum McFadzean (Stevenage). Second Half begins AFC Wimbledon 1, Stevenage 0. First Half ends, AFC Wimbledon 1, Stevenage 0. Attempt saved. Sean Rigg (AFC Wimbledon) right footed shot from outside the box is saved in the centre of the goal. Corner, Stevenage. Conceded by Jonathan Meades. Goal! AFC Wimbledon 1, Stevenage 0. George Francomb (AFC Wimbledon) header from the centre of the box to the top left corner. Assisted by Dannie Bulman with a cross.